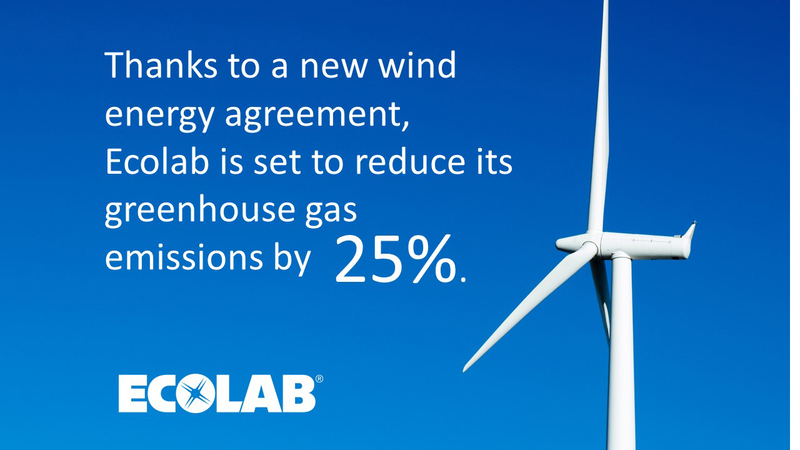 Through this agreement, Ecolab is set to reduce its GHG emissions by 25 percent. ST. PAUL, Minn., December 18, 2018 /3BL Media/ – Ecolab Inc., the global leader in water, hygiene and energy technologies and services that protect people and vital resources, has signed an agreement to support Clearway Energy Group’s 419-megawatt (MW) wind farm, Mesquite Star, in Fisher County, Texas. Construction of the Mesquite Star wind farm is scheduled to begin in the first half of 2019. Through a virtual power purchase agreement (VPPA) – Ecolab’s first – the company will support construction of 100 MW of new renewable electricity capacity within the Mesquite Star wind farm. The renewable electricity generated under Ecolab’s 100 MW VPPA is expected to cover 100 percent of the company’s annual domestic energy use and builds upon the 5 MW of community solar subscriptions in Minnesota that Ecolab signed with Clearway in 2015. “We continually work to improve the sustainability footprint of our customers’ and our own operations, and the renewable electricity generated from the Mesquite Star wind farm will help us reduce our greenhouse gas emissions 25 percent by 2020 versus a 2015 baseline,” said Emilio Tenuta, vice president of Corporate Sustainability, Ecolab. Mesquite Star is one of more than 60 utility-scale wind and solar projects that Clearway is developing in the U.S. to help utility and corporate purchasers achieve renewable energy goals. Clearway’s footprint of renewable energy projects, including assets owned through affiliate Clearway Energy, Inc., totals 4.1 gigawatts (GW), including 2.8 GW of wind, 1.1 GW of utility solar and more than 300 MW of distributed and community solar. Ecolab’s VPPA agreement with Clearway is part of a broader trend among corporate buyers. In the past year alone, VPPA contracts for 5 GW of renewable energy have been signed in the United States. A trusted partner at nearly three million customer locations, Ecolab (ECL) is the global leader in water, hygiene and energy technologies and services that protect people and vital resources. With annual sales of $14 billion and 48,000 associates, Ecolab delivers comprehensive solutions, data-driven insights and on-site service to promote safe food, maintain clean environments, optimize water and energy use, and improve operational efficiencies for customers in the food, healthcare, energy, hospitality and industrial markets in more than 170 countries around the world. FOr more information, visit www.ecolab.com. and staffed with functions specific to renewable energy generation and distribution. With assets across 28 states, more than 500 employees and the capacity to power about 2.7 million homes, Clearway is bringing reliable and clean power to market from day one. The Company is headquartered in San Francisco, CA with offices in Carlsbad, CA; Scottsdale, AZ; Houston, TX; and New York City, NY. For more information, visit www.clearwayenergygroup.com.